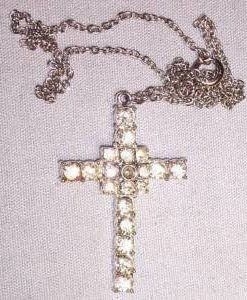 My oldest sister had a necklace like this one. In the middle was a tiny window and when you looked inside you could read the Lord's Prayer. I was always fascinated with it.....how could they make printing that tiny I wondered. We were talking about this a few moths ago and my sister said she still has it. That would make it almost 40 years old.